If you’re looking for a saddle that will help you shave seconds, win the jackpot, provide comfort for you and your horse, and more importantly, won’t cost you an arm and a leg, you’ll want to take a look at an array of used barrel racing saddles from The Horse Saddle Shop. These used barrel racing saddles feature high cantles with deep pocket suede seats to hold you in your seat. There’s also a ridge around the back seat (hip hugger). The skirts are shorter with in-skirt rigging to make a lighter, less bulky saddle. There is a wide range of benefits that come from buying used barrel racing saddles as they come at a cheaper price, which means they can fit any budget. Also, buying a used saddle means it’s already broken in. But how much can you really save? You can save anywhere from 25%-50% off of used horse saddles. That really depends. Used barrel saddles should be considered if you’re an inexperienced rider. But for professional riders you should go for a new barrel saddle. Some used saddles, even though they’re used, will still seem like they cost a lot. But the quality is so high, and you can rest assured that your saddle has been inspected, you won’t mind spending a little more. Still, it would be cheaper than buying a new saddle. Where can you find the best quality used barrel racing saddles? 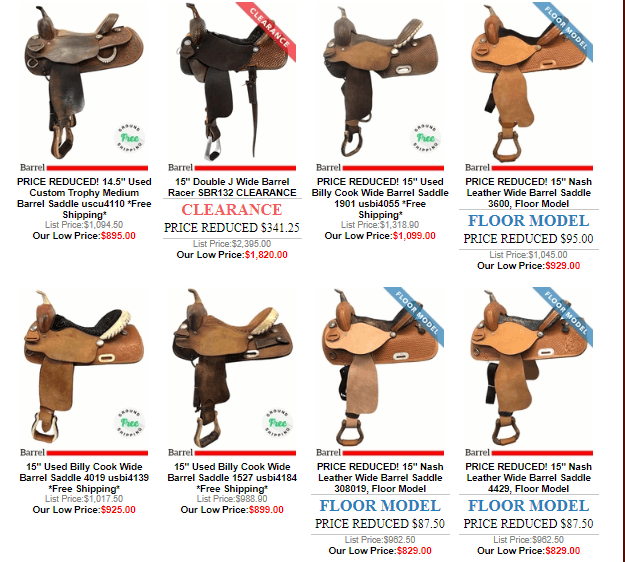 The Horse Saddle Shop offers a wide variety of brands and types of used and new horse saddles. Just click here to browse through their wide selection of used Barrel Racing Saddles. If this post was helpful, please leave your comments below.